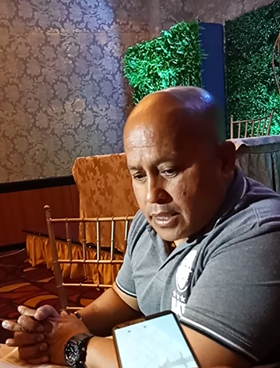 NAGA CITY (Bicol Standard) – Former PNP Chief and now senatoriable Ronald “Bato” Dela Rosa said he would ask for forgiveness for those who died in the drug war, if given a chance to meet with Archbishop Rolando Tria Tirona of the Archdiocese of Caceres. “Pag nagkaharap kami, sabihin ko sa kanya, Archbishop ako po ay humihingi ng tawad sa lahat ng mga namatay sa aming war on drugs, dahil konsensya ko po iyon,” he told the members of the media in a brief news conference held at Avenue Plaza Hotel here this morning. “Kahit hindi ako mismo ang pumatay o nakipagbarilan sa kanila, pero ako po ang PNP Chief, it happened during my watch so konsensya ko po yun,” he clarified. “Ako po ay maka-Diyos na tao,” he further stated. Asked what response he expects from Tirona, Dela Rosa said he believes he would be forgiven. “He [Tirona] is a representative of God, at ang Diyos, pag nasa puso mo yung pagsusumamo, yung paghingi ng tawad, pagbibigyan ka naman siguro,” he added. Dela Rosa is in Naga City to woo supporters in his senatorial bid. If elected, he said he will push for the re-imposition of the death penalty, only for bigtime drug traffickers, and not for smalltime drug users. He will also attend to the needs of OFWs in distress, especially those in the Middle East who are victims of the abuses of their employers. Meantime, in the Bicol region, he said he would support the plan to implement the flood control projects. Dela Rosa believes his edge over the other candidates is his sincerity and honesty. “I am fundamentally honest. Those are not my words, but the President’s. During my stint as police officer, I was never involved in corruption and other abuses,” he asserted. “We are only given one chance in this life to do good, so let us make the best of it,” he emphasized. Dela Rosa has a number of meetings scheduled in the province of Camarines Sur to spread his advocacies.